LANSING, Mich. – A first-of-its-kind study released Monday by Michigan United Conservation Clubs shows Michigan ranks first among the Great Lakes states for jobs created from hunting- and fishing-related purchases – and generates more than $11.2 billion annually. The data also show 171,000 jobs are created and supported annually across Michigan by hunting and fishing, putting those related activities in the top 10 percent of the state’s job-creation industries. The greatest impact occurs in Southeast Michigan. Michigan United Conservation Clubs commissioned the groundbreaking study in partnership with the Michigan State University Eli Broad College of Business and with funding support from the C.S. Mott Foundation. The project’s goal was to more accurately quantify the impact sportsmen and sportswomen have on Michigan’s economic well-being. Findings from the MUCC-MSU study were released during a news conference at MSU’s Demmer Center in Lansing that in addition to Trotter was attended by Michigan Department of Natural Resources Director Daniel Eichinger; state Sen.
Curtis Hertel Jr., D-East Lansing; Bill Demmer, director of MSU’s internationally acclaimed sports shooting training facility that was the site of the news conference; Jeff Poet, president and co-owner of Jay’s Sporting Goods and a member of the Michigan Wildlife Council; and leaders in Michigan’s business, conservation and tourism sectors. MUCC also hosted an afternoon news media teleconference that included Trotter; Eichinger; Dennis Eade, executive director of the Michigan Steelhead and Salmon Fishermen’s Association and a member of the Tourism Industry Coalition of Michigan; state Rep. Gary Howell, R-North Branch, chair of the House Natural Resources Committee; and state Rep. Leslie Love, D-Detroit, co-chair of the Michigan Legislative Sportsmen’s Caucus. The MUCC report is believed to be the most comprehensive effort to date measuring the annual statewide economic impact by Michigan’s 700,000 hunters and 1.1 million anglers: $8.9 billion from hunting and $2.3 billion from fishing stemming from purchasing gear and clothing, booking hotel rooms, buying meals and more. Previous estimates in Michigan and other states are based on a narrow formula that was applied most recently in 2011. Those estimates were derived from survey results of just 187 Michigan households and showed hunting and fishing contributed $4.7 billion annually to Michigan’s economy and supported 72,000 jobs. 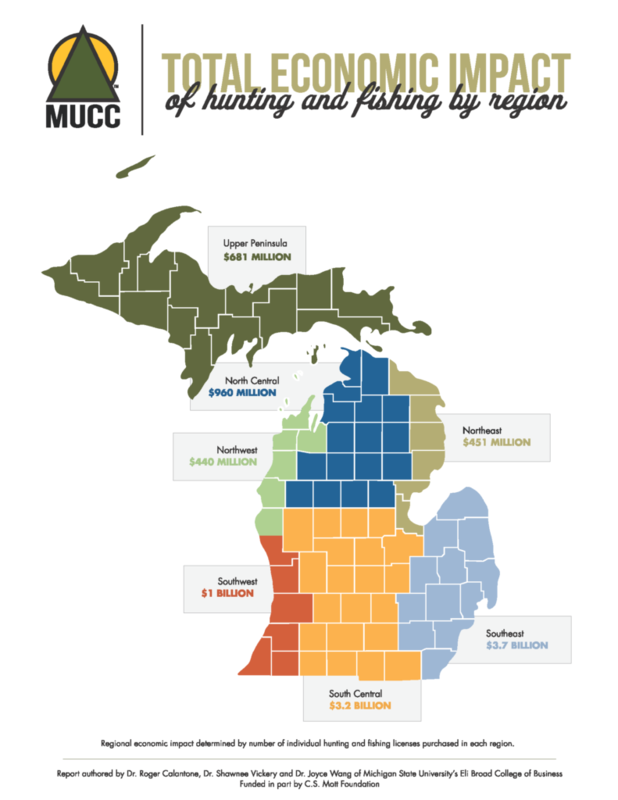 The MUCC report is based on 2016 spending data and uses a new, state-of-the-art economic modeling formula to clarify in more precise detail the contributions of hunting and fishing to Michigan’s economy. The findings are based on a more robust analysis of data from the DNR and the U.S. Department of Commerce. “Because of the MUCC analysis, people who never hunt or fish should have a new appreciation for the economic power Michigan’s sportsmen and sportswomen deliver and that helps make our state a great place to live, work and recreate,” Howell said. In comparison with all states in the U.S., Michigan ranks 11th in terms of job creation resulting from hunting and fishing expenditures by residents and 15th nationally with respect to job creation arising from hunting and fishing expenditures by out-of-state residents, MSU researchers found. The MUCC report was authored by Professor of Business Dr. Roger Calantone, Demmer Legacy Professor Dr. Shawnee K. Vickery and Dr. Joyce Wang, all within MSU’s Eli Broad College of Business. “It’s clear that small businesses throughout the Great Lakes State rely on hunters and fishermen to keep their cash registers ringing all year long,” said Jeff Poet, president and co-owner of Jay’s Sporting Goods and a member of the Michigan Wildlife Council. Additionally, license fees and surcharges on hunting and fishing pay for most of the wildlife conservation and habitat restoration work done by the DNR. But as the number of people hunting and fishing continues to decline with an aging population, state leaders are concerned how the resulting revenue loss will affect Michigan’s economy – and natural resource conservation efforts. A recent demographic analysis conducted by Michigan Technological University shows the number of firearm deer- hunting licenses sold in Michigan has dropped nearly 21 percent over two decades – from a 1998 high of 785,000 deer hunters to 621,000 in 2017. By 2035, projections are that the late-’90s rate will be cut by more than half. “Hunters and anglers foot virtually the entire bill for conservation in Michigan and across the nation. A continued decline in that base has huge implications for how we manage conservation of our forests and fields, wildlife, our lakes, rivers and streams today and in the future,” Eade said. While the DNR, sporting groups and the state’s Pure Michigan campaign are expanding their outreach to attract younger hunters, minorities and women, Howell and Love said they are committed to ensuring Michigan will explore more innovative strategies to adjust to the state’s aging hunters and fishermen population. “We must work together to better promote the joys and opportunities of hunting and fishing in the Great Lakes State to younger and more diverse audiences if we want to grow participation and ensure these sports remain a key cog in Michigan’s economy,” Love said.